The Bakersfield Condors announced the team will hold the Three-Way Chevrolet Condorstown Outdoor Classic presented by Mission Bank at Bakersfield College’s Memorial Stadium against the Ontario Reign on Saturday, Jan. 7, 2017. In mid-December, a temporary ice rink will be built in Memorial Stadium and it will be open to the public for skating on Dec. 21. “There will be a number of other activities designed for family fun. Among them, zip-lining, obstacle courses, kids’ play areas, snowman building and more,” said Bakersfield Condors president Matthew Riley. This idea has been floating around the minds of the Condors’ front office for years, and now it’s finally becoming a reality. “The NHL’s first outdoor hockey game was between the Edmonton Oilers and Montreal Canadiens 13 years ago. It was with that game, that we half-jokingly said, wouldn’t it be cool to do an outdoor game in Bakersfield,” said Riley. Riley thanked Three-Way Chevrolet President Ted Nicholas and Mission Bank President and CEO A.J. Antongiovanni for sponsoring the event. Riley also said that they are still looking for another presenting sponsor to help Three-Way Chevrolet and Mission Bank headline the event. “We’re looking for other sponsors as well, companies to purchase groups of tickets and the actual items to support the ice rink; generators, fuel, equipment, decking, rubber matting, dirt, sod, food trucks, Porta Pottis, you name it. We need a lot of stuff to make this thing happen. We invite everyone to be a part of this great community event,” said Riley. Bakersfield College President Sonya Christian also thanked the sponsors and the people working hard to make sure this event will take place. Christian was very pleased that BC’s Memorial Stadium was chosen as the venue to hold this event. “It is a privilege to have BC’s Memorial Stadium selected as the location for such a local prestigious and spectacular event. The Memorial Stadium was built in 1955 with a grand vision of bringing our community together, 20,000, creating extraordinary occasions,” said Christian. Bakersfield Mayor Harvey Hall spoke very highly of the Condors and how they’re so involved in the community. 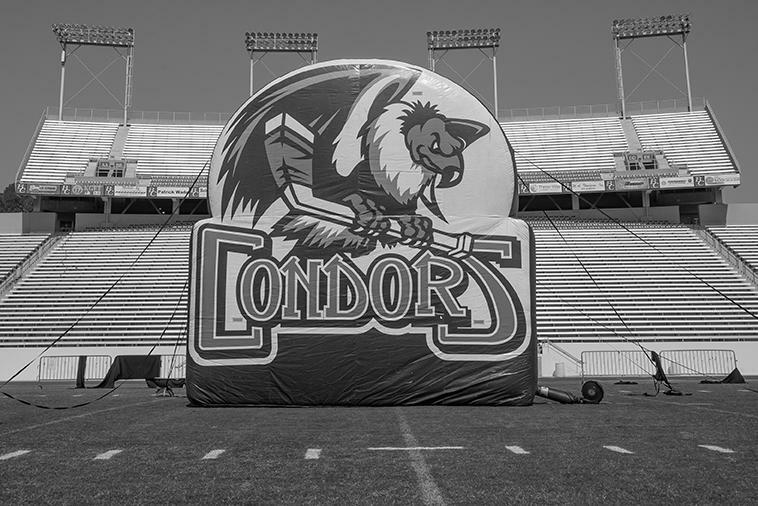 “I’m so proud of the ongoing effort that the Bakersfield Condors do in our community. With all of their constant community outreach, all of the support of educational opportunities, and most importantly putting products on the ice that bring people to the venues, in which they play, to make hockey a special occasion,” said Hall. Three-Way Chevrolet is one of the main sponsors of the event and has been partners with the Condors off and on for the past 15 years. “We’re celebrating our 60th anniversary this year and this community has supported us for a long time. This is just one way where we feel we can give something back,” said Nicholas. “They’re a charitable organization, there’s a lot of things that they do that we do with our organization too. Antongiovanni also spoke as to why Mission Bank decided to go ahead and sponsor this event as well. “First of all, because it’s Matt (Riley) and his team and the Condors and Condorstown and we love it. It’s a great thing for our community and they do come up with great ideas. It’s going to be fun, it’s going to be unique, we’re going to have our families out here so it’s going to be a lot of fun and we want to support that,” said Antongiovanni. “The other reason we chose to support this event and why we continue to support the Condors is because it really closely aligns with our mission and our purpose. So the purpose of Mission Bank is to fuel and grow vibrant and prosperous communities. Two-time Stanley Cup winner and Oilers Vice President of Player Development Kelly Buchberger spoke on behalf of the Oilers and how they’re really excited about this game. “Having an outdoor game in Bakersfield continues the rivalry between Edmonton and Los Angeles. These young prospects are future stars in the NHL and they’re going to have an impact when they start playing in the NHL, so for us to watch them develop in the AHL is huge for us,” said Buchberger. Bakersfield Condors Head Coach Gerry Fleming also acknowledged how much work it’s going to take to make sure that this event will happen and thanked everyone involved for giving them this opportunity. Events like this don’t happen like this just because you want them to happen. There’s a lot of foresight, there’s a lot of hard work and there’s a lot of dedication from a lot of people involved,” said Fleming. For any additional information about the game, you can visit the website http://www.bakersfieldcondors.com/classic/.